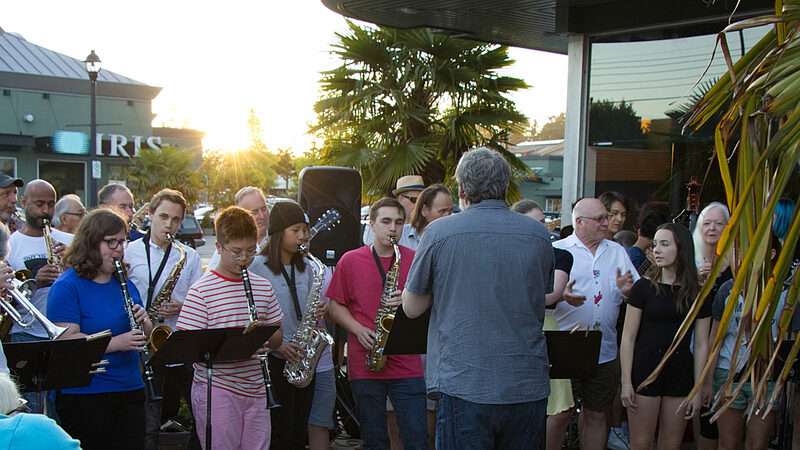 The fifth edition of our South Delta Jazz Festival came to a fine conclusion with our two festival concerts. Friday night featured singer Carmen J. Price singing a selection of jazz standards with the festival band with Lorne Kellett on piano and Ed Orgill on tenor saxophone, with Rob Kohler on bass and Stan Taylor on drums. Saturday afternoon featured o ur student workshop ensembles performing on the grounds of Delta Hospital Fine weather and Hot Jazz entertained the crowds from ourf 7 student groups and faculty guests. Here are some photos of the crowds relaxing in the shade on a warm summer day. Thanks to the Delta Hospital Foundation for cosponsoring this performance with us. Thanks to Envision Credit Union for providing the tents for the day. A special thanks to our Festival title sponsor Century Group who has been with us since the beginning.